Beauty Under 10 | Beauty should only take 10 minutes 4 YEAR BLOG ANNIVERSARY!!!! Today is my Blog Anniversary! 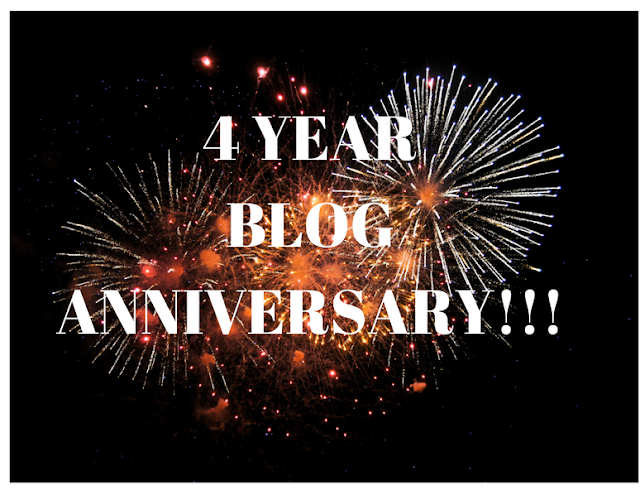 4 years ago today I decided to take the step into the world of blogging. I don’t think I even told anybody that I had started my blog until a month or so later. I knew this was something I really wanted to do, it combined my passion for writing and beauty. I didn’t think my little blog would get any type of response but I started getting page views, more and more each week , wonderful emails from readers and I’m here I am 4 years later still loving it. I decided to start blogging because I read blogs and enjoyed them, and I’m the go-to beauty advisor for friends and family – always giving some kind of advice lol. I would read one of my favorite bloggers post or reviews and think of what I would have wrote or said about that product, I started researching on Starting a Blog, what goes into blogging. Something I learned when I started blogging, was just how much more there is to blogging than just writing and publishing a post, the work that goes on behind the scenes- filming, pictures, research - at first can be a bit overpowering, but in time becomes something you do naturally. When I started writing my blog, I never imagined anyone would be interested but I have watched my blog grow from strength to strength. I am amazed that people follow me and I get new followers daily, and the support that they give me, I am very grateful to each and every one of you and hope you continue to enjoy the beauty tips and hair tricks.